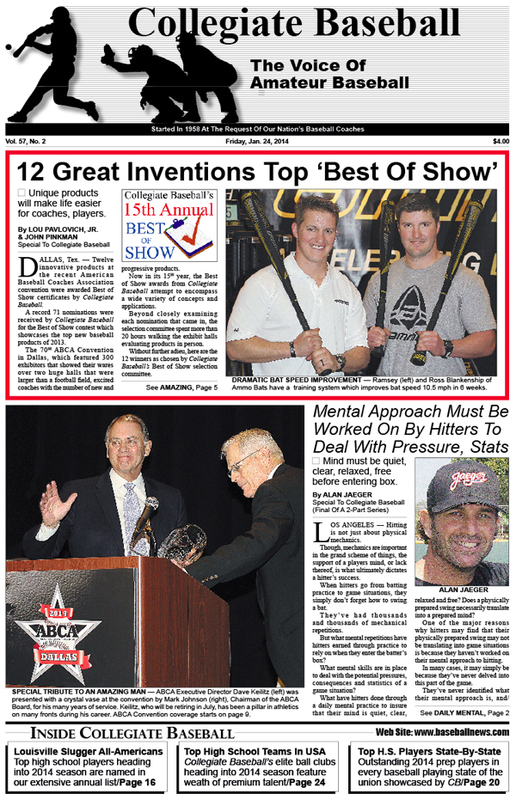 • Top 12 inventions for baseball at the recent American Baseball Coaches Assn. Convention in Dallas are named. • Louisville Slugger 2014 pre-season high school All-Americans by position. • Complete rundown on top high school players in every baseball playing state in the USA. • In-depth look at the top 30 high school teams in the nation entering 2014 season led by No. 1 Owasso, Okla. which was 36-0 last season. • Danger is always present with colleges that insist on using 15-passenger vans. • Despite toughest penalties in history, ejections and suspensions are up in NCAA baseball. • Complete coverage of the American Baseball Coaches Association Convention in Dallas. • All of the award winners from ABCA Convention listed in rundown. • University of Louisville pitching coach Roger Williams wins prestigious Teaching Pro Award. • Ruleball: Rich Marazzi feels coaches must monitor umpire awards for overthrows in dead ball territory. • Charlie Greene explains what it takes to be a great pitching coach. • John Michael Boswell claims 8th annual Power Showcase title with amazing home run display. • Ron Wolforth gives in-depth rundown on how he worked with Scott Kazmir which allowed Kazmir to be effective as a Major League pitcher once again.